During a Nov. 18 community meeting, we learned that we will have to wait another 18 months for the already delayed construction and implementation of the 17th Street SE recommendations of the District Department of Transportation’s 17th & 19th Street Safety Improvement Project. The reason? DC Water needs to replace water mains from C Street NE to Potomac Avenue SE. DC Water contractors will begin the water main work in Jan. 2015 (weather permitting) at C Street NE and will proceed down 17th Street until they reach Potomac Ave SE. DDOT contractors will follow the DC Water crews down 17th Street until the safety improvements are complete, likely by May 2016. While I’m still extremely frustrated about the additional delays and lack of communication between DDOT and DC Water, I am appreciative that both agencies came out to the neighborhood to explain the project timeline and answer questions. I also suggested that DDOT work to implement the 17th Street safety improvements between Potomac Ave SE and Barney Circle SE as soon as possible since this area will not experience water main construction. Note that construction on the 19th Street portion of the project will begin soon and will be completed by March 2015 (again weather permitting). Ward 6 Councilmember Tommy Wells is hosting a community meeting on Thursday, Dec. 11, 7:00 pm to share the Office of Planning’s final concepts for the Barney Circle-Southeast Boulevard Planning Study. The meeting will be at Friendship Charter School Chamberlain Campus (1345 Potomac Ave SE). While all three concepts are much better than DDOT’s original concepts for the study, I’m curious to hear from residents. Feel free to post your comments below and/or attend the Dec. 11 meeting. In 2015, DDOT will be evaluating the final OP concepts and resuming the BC-SE Blvd. transportation planning study. DDOT has released three alternatives for the ongoing Pennsylvania-Potomac Avenue Intersection Pedestrian Safety Study. The three alternatives – Triangle Parks, Rectangular Park and Ellipse Park – are totally different from the concepts reviewed by the public and ANC 6B in May 2013. The T-intersection option – favored by ANC 6B – has been eliminated. Even more confusing is DDOT’s apparent decision to avoid scheduling another public meeting to review the new alternatives. The only opportunity for public input on the new alternatives was a DDOT “information booth” placed at the Potomac Avenue Metro station on Nov. 6 between 3 and 5 pm, a time when a majority of residents are at work. Please e-mail DDOT at pennpotomac@prrbiz.com and tell them they need to schedule a public meeting on their alternatives. Comments are due Dec. 8. In February, ANC 6B will be considering Goldstar Group’s request for a variance from the parking space size requirements for their proposed 41-unit residential building at 1500 Pennsylvania Avenue SE (old Domino’s Pizza site). Goldstar plans to provide the required parking minimum for the building (21 spaces) but needs to include 8 compact spaces in its count. Under the current DC zoning code, compact spaces can only be counted towards the minimum requirements in garages with more than 25 parking spaces. The Board of Zoning Adjustment will consider Goldstar’s variance request at a hearing on Feb. 25. ANC 6B’s Planning & Zoning Committee will consider the variance request, along with the raze permit for the current building, at its Tuesday, Feb. 4 meeting, 7 pm at St. Coletta of Greater Washington (1901 Independence Ave SE). During the committee meeting, Goldstar Group will provide a brief presentation of their plans and explain why they need the parking space size variance. Attendees will have an opportunity to ask questions and weigh in with the committee. Note that 1500 Penn Ave SE is the first case on the committee’s agenda. Attendees will also have an opportunity to weigh in on the case during ANC 6B’s February 11 meeting, 7 pm at the Hill Center (921 Pennsylvania Avenue SE). The commission will consider the planning & zoning committee’s recommendation and take a formal vote in support or opposition of the request on Feb. 11. I encourage all interested neighbors and residents to attend the meetings and/or contact me with their concerns. For those who wish to chat with me in person, I’ll be at Curbside Cafe (257 15th Street SE) tomorrow, Sat., Feb. 1 from 11 am – 12 pm. Pennsylvania Avenue Elevation of Proposed Residential Building at 1500 Penn Ave SE. Design by Bonstra Haresign Architects. Around 30-40 residents attended the Nov. 4 community meeting on 1500 Pennsylvania Avenue SE (old Domino’s site). Eric May of The Goldstar Group shared his company’s plans to build a 41 unit residential building on the site. May was joined by the project’s architect, Rob McClennan of Bonstra Haresign Architects. A big thanks to Erik Holzherr, owner of Wisdom, for hosting the meeting. The building will be entirely residential with 41 condos. Unit size will vary from studio, one bedroom and two bedroom, though most of the units will be one bedroom. When asked by an attendee if Goldstar would consider switching the building to apartments from condos, May responded that Goldstar is “99 percent” sure that they will stick with condos. May said that Goldstar considered a retail component but decided that the building would complement the new Douglas Development retail building going in across the street at 1442 Pennsylvania Avenue SE. Douglas expects to complete the construction on 1442 by the end of the year. The bulk of the building will be towards the 15th Street SE and Penn Ave, not towards Freedom Way. The building height will be 44 feet, 6 feet below the 50 foot height limit on the site. There will be a 750 square foot roof deck towards the 15th/Penn Ave side of the building and air conditioning units will be located on the roof. View the building elevations (pdf) from 15th Street SE and Penn Ave SE. Goldstar plans to include private gardens for the first floor units facing Freedom Way, which should provide some “breathing room” between the building and the residences behind it. The upper units will not have balconies. When asked if Goldstar would do a shadow study to see how the building would affect light and air on Freedom Way, May replied that he would consider it but did not think the building would dramatically impact light & air, particularly since it will not be built to the lot line. The main entrance to the building will be at the corner of 15th & Pennsylvania Avenue SE. There will not be an entrance to the building off of Freedom Way SE – the property does not have access to Freedom Way. Goldstar will build an underground parking garage with the required 21 spaces. The entrance to the garage will be off 15th Street SE and there will be a garage door. Since the garage will include 8 compact parking spaces, Goldstar will have to ask the Board of Zoning Adjustment for zoning relief (parking garages with less than 25 spaces can not count compact spaces towards the minimum requirement in the zoning code). This also means that ANC 6B will have an opportunity to weigh in on the zoning case once it is filed. View the garage level plans (pdf). Trash pick-up and loading would likely take place off of 15th Street SE. May hopes that trash can be picked up in the underground garage and not wheeled out to the curb. He plans to work with the District Department of Transportation and surrounding neighbors to determine appropriate loading/moving times. An attendee asked whether building residents will have the opportunity to purchase residential parking permits (RPP). I responded that since the 1500 block of Pennsylvania Ave SE is classified as an RPP block, residents of the new building will be able to purchase RPP stickers. And since Goldstar plans to meet the minimum parking requirement, they will likely not be subject to any RPP limitations by the BZA. May said that the materials and color of the building have not been finalized. They plan to make decisions about materials in the next two months. Goldstar hopes to apply for building permits in the next two weeks. Since there used to be a gas station on the site, they will have to remove and replace contaminated soil. The BZA case will also add to the project’s timeline. May hopes to begin construction in March 2014. My guess is that construction will not begin until summer or early fall of 2014. Since the 1500 block of Pennsylvania Avenue SE could potentially see 3 construction projects going on at the same time (1500 Penn, 1600 Penn and 732 15th Street SE), I plan to work with the three development teams to ensure they are working to minimize disruption to neighboring residents. Please post your comments and feedback below. And thanks to everyone who attended Monday’s meeting! The commission voted unanimously (10-0) to send a letter (pdf) to Victor Hoskins, Deputy Mayor for Planning and Economic Development, urging his office to move forward with the Donatelli/Blue Skye proposal for parcels F1 & G1 of the Hill East Development/Reservation 13. The commission’s letter also includes specific comments on the Donatelli/Blue Skye plans and urges Mayor Gray and DMPED to take action now to prepare the remaining parcels on the 67-acre site for development. A big thanks to my commission colleagues and the many residents who provided feedback on the proposal and on early drafts of the letter. I announced that BB Otero, Deputy Mayor for Health and Human Services and David Berns, Director of the Department of Human Services had agreed to discuss the future of the DC General shelter at a June 27 ANC 6B Hill East Task Force meeting. The meeting will be from 6:30 pm – 8:00 pm at St. Coletta of Greater Washington, 1901 Independence Avenue SE. After lengthy discussion and debate, the commission voted 9-0-1 to support a special exception and variance request that would allow City Dogs, a doggie daycare and boarding facility, to open at 1310 Pennsylvania Avenue SE. This was a very difficult case, particularly since one of the adjacent neighbors had converted her property from a commercial to residential use. City Dogs’ willingness to agree to additional operating conditions (pdf) with the commission ultimately persuaded me to support the case. I also agreed with the majority of commissioners that the commission should request that Board of Zoning Adjustment review the use after a certain period of time to ensure that all conditions are being met. Kudos to Commissioner Nichole Opkins (6B06) for her hard work in getting to an acceptable compromise. The commission unanimously supported sending a letter (pdf) to the District Department of Transportation outlining our views on the Pennsylvania-Potomac Avenue Intersection Pedestrian Safety Study. 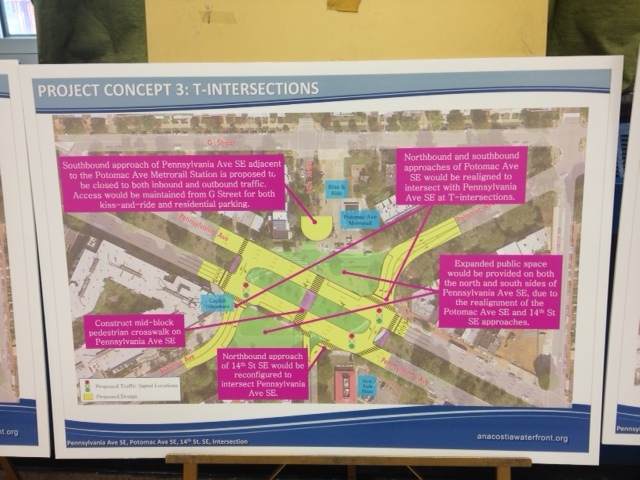 In the letter, the commission supports concept 3, which would create “T-intersections” and significantly improve pedestrian safety around the Potomac Avenue Metro plaza. Kudos to Commissioners Kirsten Oldenburg (6B04), Sara Loveland (6B07) and Nichole Opkins for their work on the letter. Given my previous work on improving ANC 6B’s bylaws, I was extremely pleased that the commission overwhelmingly approved two amendments to the bylaws. The first amendment, which passed unanimously, clarified that Commissioners can only nominate resident members who live in their Single Member Districts (SMDs) to committees and task forces. The second, which passed 8-1 (7 votes needed), finally allows resident members to vote in ANC 6B committees and task forces. Now residents who take the time to serve on committees can vote on recommendations to the full commission. A big thanks to Commissioner Brian Pate (6B05) for introducing the amendments. On an 8-0-1 vote, the commission approved a package of letters on problematic vacant and blighted properties in the commission area. One letter (pdf), addressed to the Vacant Buildings Unit at the Department of Consumer and Regulatory Affairs, lists problematic vacant properties in each ANC 6B Single Member District, including 6B09. The commission will also send letters directly to vacant property owners urging them to improve their properties and comply with the law. Commissioner Oldenburg provided an update on efforts to support Frager’s and the other businesses impacted by the June 5 fire. She mentioned the Friends of Frager’s website, where individuals can make tax-deductible contributions to support Frager’s through the Capitol Hill Community Foundation, and encouraged attendees to visit the Frager’s Garden Center “pop up” across from Eastern Market. The commission heard a presentation by Juan Thompson of Serve DC, the Mayor’s Office on Volunteerism, who discussed the office’s efforts to emergency training preparedness efforts. The office is currently looking to recruit residents to serve in neighborhood corps, volunteers who would be able and willing to help neighborhood’s respond in the case of an emergency. You can read more on how to get involved in these efforts on the Serve DC website. ANC 6B’s July meeting will be on Tues., July 9, 7 pm at the Hill Center, 921 Pennsylvania Avenue SE. 1500 Pennsylvania Avenue SE, former site of Domino’s Pizza. Another indication of “weak market demand” in Hill East: Bisnow Real Estate recently reported that the Goldstar Group, a private equity firm based in Bethesda, has purchased the Domino’s lot at 1500 Pennsylvania Ave SE and plans to build a 40-unit residential building on the site. While the building will be mostly residential, Goldstar has not ruled out retail on the first floor of the building. The retail would be small given the lot size. As of now, they plan to build the building “matter of right,” and do not anticipate needing any zoning relief or variances. Goldstar believes they can fit the required 20 parking spaces on the site. Goldstar will spend the next four months designing the building. In terms of height, they plan to start at the height allowed under the site’s current zoning (C-2-A, 50 ft.). Height could be adjusted based on design. 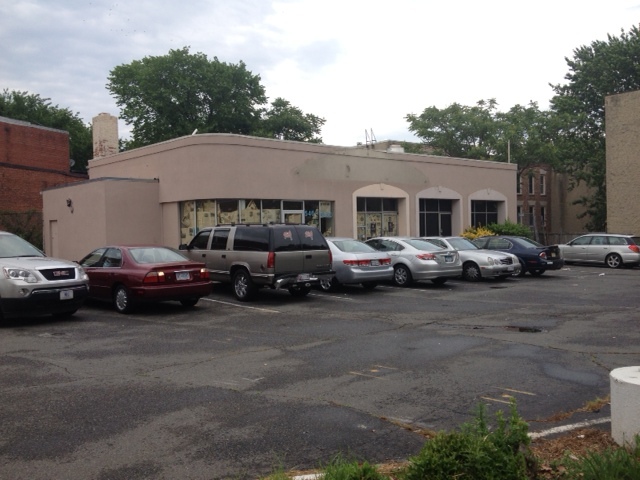 The adjacent laundromat building just north of the site (732 15th Street SE) is not a part of the project. A separate owner, Gary Cohen, still plans to build a small condo building on the laundromat site. Regardless of whether they seek zoning relief or not, Goldstar is very interested in coming out to the neighborhood to share their plans with the neighborhood, probably sometime this fall. If everything goes smoothly with permitting, etc. , they hope to begin construction in early 2014. You can read more about the Goldstar Group at www.thegoldstargroup.com. The District Department of Transportation will hold Public Meeting #2 for the Pennsylvania-Potomac Avenue SE Intersection Pedestrian Safety Study this Thursday, May 16, 6:30 pm – 8:30 pm at Payne Elementary School (1445 C Street SE). 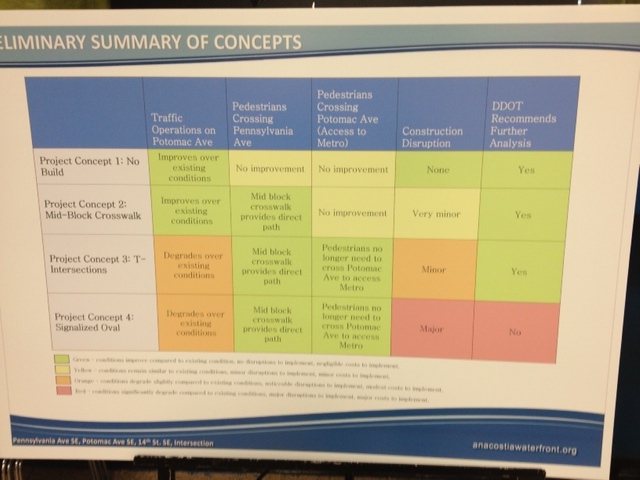 DDOT is expected to share design alternatives for public feedback. Read more about the Penn-Potomac Intersection Study. Donatelli/Blue Skye Development, the sole respondent to the recent Hill East/Reservation 13 RFEI, will once again present their plans at ANC 6B’s Hill East Task Force meeting on Wednesday, May 22, 6:30 pm – 8:00 pm at St. Coletta of Greater Washington (1901 Independence Avenue SE). If you missed the April 24 meeting, this will be an opportunity to see the proposed plans for parcels F1 & G1 and share your comments. ANC 6B will likely submit formal comments to the Office of the Deputy Mayor for Planning and Economic Development in June. Hope to see you at both meetings! You are currently browsing the archives for the Potomac Avenue Metro category.